Understanding grammar will help you on your way to foreign language fluency. When learning the Italian language, you’ll soon see that dealing with tenses in English it is relatively simple. There are the usual exceptions that make it a little harder to conjugate, like irregular verbs like “swim” and “run”, but compared to Italian verbs, this is really easy. In fact, most western languages have more complex conjugations than English. Like articles, you are going to find yourself having to adjust verbs based on if the subject is singular or plural, and the person being talked about. Like English, in Italian grammar there are simple and compound tenses. The simple tenses are formed changing the ending of the infinitive verb with a specific conjugation ending. Note that when the the subject is expressed by a personal pronoun, the Italian language tends to omit it. Thanks to the conjugation endings it is understood who the subject is, since the endings of conjugated verb forms already indicate person and number. The compound tenses have an additional verb, called auxiliary verb. This is the verb that has to be conjugated, and then you have the past participle (in the next paragraph we will see how to form the past participle). Unlike English, in Italian both the verb “avere” (have) and the verb “essere” (be) function as auxiliary verbs. The following table shows you how to form the past participle. For those verbs that require “essere” (to be) as auxiliary verb, you will need to change the past participle to match the gender and the number of the subject. My cousin came yesterday. Mio cugino è venuto ieri. My sister came to school. Mia sorella è venuta a scuola. My parents went home. I miei genitori sono andati a casa. Our daugthers went downtown. Le nostre figlie sono andate in centro. Perfect tenses are used to describe an action that has already been completed in the past or to describe something that will occur in the future at an earlier point than the time being spoken about. It can also express a condition that must be met for something to happen. Like the other compound tenses, the auxiliary verb is required. When you want to talk about something that you did once, use the present perfect. Think of it as a way of expressing a specific event or occurrence in the past. Based on the context, it can translate the English Present Perfect or the English Past Simple. To discuss something in the immediate past, you can add “appena”. This is equivalent to adding “just” in front of the verb to express that it was a recent action or event. They just learned about the show. Hanno appena saputo dello spettacolo. To describe something that happened repeatedly in the past, use the imperfect form. It can also translate the English construction “used to + infinitive”. When I was a child, I always got sick. Quando ero piccolo, mi ammalavo sempre. They used to the theater every week. Andavano al teatro ogni settimana. Italian also has a specific past tense for discussing something in the distant past, usually historical events. It is not likely you will encounter this in every day discussion. Leonardo da Vinci was born in Italy in 1452. Leonardo Da Vinci nacque in Italia nel 1452. In Italian you can usually use the present tense to express future actions, expecially when it is something that is about to happen. I’ll take a taxi Prendo un taxi. I will go home tomorrow. Domani torno a casa. I will go home next week. Vado / Andrò a casa la prossima settimana. In Italian you can also use future tense to express a probability or a doubt. She must be tired. Deve essere stanca. Could it be the cat or the dog? Sarà il gatto o il cane? When you use the progressive form in the present, you are expressing something you are currently doing. In the past it expresses something happening at the same time of another past action. It is formed conjugating the verb “stare” followed by the present participle (in the next paragraph we will see how to form the present participle). We are going to school. Stiamo andando a scuola. I was working when the phone rang. Stavo lavorando quando il telefono ha suonato. In English, the present participle is formed with the ending “-ing”. In Italian you can follow the pattern shown below. You can use the present participle with another verb form like in the case of the progressive tense on its own. You learn by your mistakes. Sbagliando si impara. The conditional mood is used in Italian to express a desire or wish. She would like a cup of tea. Vorrebbe una tazza di tè. I would go, but I have to stay here. Andrei, ma devo restare qui. 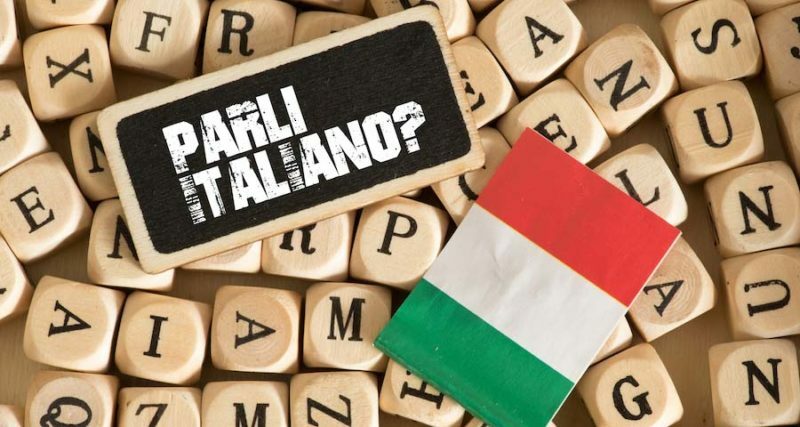 The subjunctive is used in Italian to express a doubt, possibility, uncertainty, or personal feelings introduced by certain expressions like “sembra che” (it seems like) or verbs which introduce an opinion like “pensare” (to think). He thinks the dog has left. Pensa che il cane sia andato via. It seems the washer is broken. Sembra che la lavatrice sia rotta. There are four tenses in the subjunctive mood. Present subjunctive is used to express uncertainty for both present and future events. She doubts it is over. Dubita che sia finita. I don’t tink she will come. Non penso che venga. The present perfect subjunctive shows current doubts about things that happened in the past. He hopes that it didn’t snow. Spera che non abbia nevicato. The imperfect subjunctive shows uncertainty about past events that should have happened around the same time as the main clause action. She believed that he was right. Credeva che avesse ragione. The past perfect subjunctive is used to express uncertainty in the past about events happened at an earlier time than the time of the main clause. I thought that he had come back. Pensavo che fosse tornato. I had to go to Florence. Sono dovuto andare a Firenze.